Imperial actually used several line numbers which refer to what we call wide panel today. The main differences are in the width of the base compared to the rim. In fact, there would be too much to discuss in one article, so I’m going to concentrate on the 8-inch, #645 pieces. These plates are relatively common, and all have a snap base. If you find a wide panel plate that is about 8-inches in diameter with a ground base, it will be a U.S. Glass piece! The #645 pieces come in the common Imperial stretch (their crizzled effect line) colors – Iris Ice (crystal), Rose Ice (marigold), Blue Ice (smoke), Green Ice (teal), Amethyst Ice (purple), Amber Ice (amber glass) and ruby/amberina. These plates have a wide, 4-inch diameter snap base, and 14 panels. 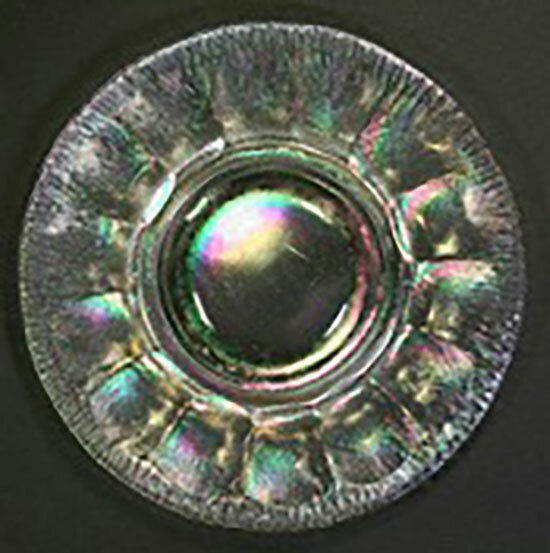 The Iris Ice pieces are the most common and it used to be common to see a stack of six to eight plates in most malls. Most of these plates have good iridescence, but some are heavily doped and have a frosty white effect. I’ve seen some plates with only the top or bottom iridized which gives a different look. The Rose Ice pieces range from very light marigold to nearly chocolate brown-iridescence. Like many of the marigold pieces made by Imperial, this iridescence can often wear off with too much cleaning, so use care and only soft cleaning! The Blue Ice pieces can also vary considerably in intensity of doping. Most are a light smoke color, but I’ve seen some very dark, multicolored pieces. The darker ones command higher prices! The Green Ice pieces are usually very similar though the base glass can look a little like Celeste Blue in some rare cases. However, when you put the plate next to a true Celeste Blue, it will show the difference. Amethyst Ice and Amber Ice plates are the least common colors, but many often mistake the Amber Ice as being a marigold without noticing that the base glass is an amber color, not clear! The ruby/amberina plates are also relatively common, but being a striking glass, the base glass can range from mainly yellow with some orange overtones to an almost oxblood red! Most are a nice amberina with the center being yellow-orange and the rim being a nice ruby. As you can see, one could make a collection of just these 8-inch plates and concentrate on the extremes of doping and striking! 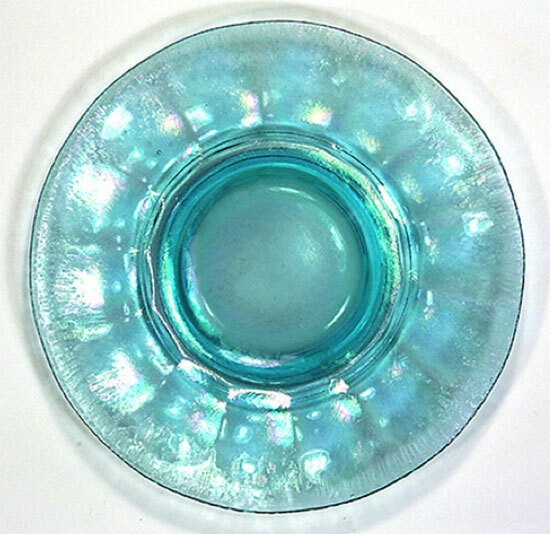 Again, if you find a true Celeste Blue or Topaz (vaseline) wide panel plate, look at the base and you’ll see that it is ground and would then be U.S. Glass pieces!